Three persons have lost their lives after fire broke out on Wednesday at Kwakyama area of Lagos-Ibadan expressway. 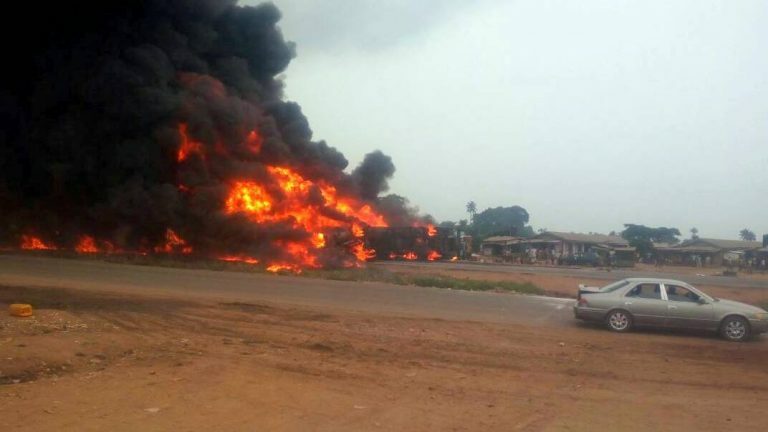 The explosion was following an accident involving a commercial bus and a fuel-laden tanker. The accident caused a heavy gridlock along the road, with many motorists and passengers stranded. The Public Relations Officer of Traffic Enforcement and Enlightenment Corps, TRACE, Babatunde Akinbiyi, who, confimed the incident attributed the tragedy to reckless driving. He said ‎the accident scene was close to Kyakyama Filling station after Ogere toll gate, inbound Ibadan. Mr. Akinbiyi said overspeeding by the truck driver made the fuel laden truck to flip over, before the ensuing fire razed a bus parked nearby. Also, the Federal Road Safety Commission, Lagos State Command advised motorists to divert to Iperu, old Lagos/Ibadan expressway. The command said rescue officers were already on ground to help the survivors.